Joel being rescued from the river. Joel worrying about his triathlon career following his accident. Joel is under the water breathing through a tube. He just make out Karl above the surface. Joel wakes up from his dream in a bath of sweat. Bill brings Anne home from the hospital. She is worried about Joel. Bill and Anne approach a guy who is hanging out. Turns out he is looking for Anne – he introduces himself as Gary O'Neill – Lily's nephew. He tells them he missed the funeral because he didn't know about Lily's death. He says Lily had mentioned Anne and had come to say thank you for looking after her and have a last look at Lily's house. He gives Anne his mobile number so they can meet up and chat about Lily. Bill is watching Gary through the window. 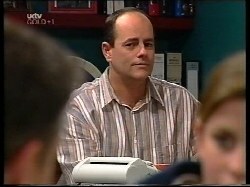 Bill thinks he is dodgy and after Lily's stuff. Anne says he seemed genuine, but Phil says people often come out of the woodwork and he might be suspicious – especially if he wasn't at the funeral. Anne is worried that Gary will be cross about Anne inheriting the house. Bill is still suspicious, so Anne suggests calling Gary and inviting him round for a cup of tea. Paul has received a parcel from Paris. He opens it to find a T-shirt from Paris with the words “Si tu me trouve si bien, emrasse-moi”[sic] (“If you fancy me, kiss me!”). Neither Madge, Harold or Paul have enough French to translate the words but Paul if chuffed with the T-shirt anyway. Bill tells Susan that Anne and Joel are doing OK. He asks why Susan is sitting around in her pyjamas – she says she's trying out something new she's heard about – unwinding(! ).She is going to nothing all day. Bill is disbelieving – Susan says to call it an experiment! They make bet on whether she can actually manage to do nothing all day! Gary has come round for tea and is telling Anne and Bill about a family feud which meant he didn't see Lily very much. Phil asks if he remembers a Madge Ramsay from back then and Gary says he does. Anne shows Gary a photo of a young boy that Gary says is him. Anne tells Gary that she inherited Lily's house. He says that if it's what Lily wanted then he's happy about it. Phil is sitting at his desk still looking suspiciously at Gary. Susan is listening to the radio and reading a book. On the radio a programme comes on – “Whinger of the Week” and says that Susan Kennedy is nominated for that week! Students are leaving Erinsborough High in droves and instead of trying to find out why, Susan has been looking for an easy solution by asking for a handout. The programme continues by saying that Libby has been helping her by writing articles favouring the school! Susan gets up and rings the radio station. She angrily demands to speak to the programme host. Susan is on the radio having a right go at the radio programme host(!). Harold is cooking stuff to take out on his homeless people's rounds tonight. Gary comes into the Coffee Shop and tells Madge he hasn't seen her for years. Madge doesn't recognise him. Harold introduces himself and says he doesn't remember Lily mentioning him. He tells Harold about the family feud and Harold says that Lily was very vague towards the end anyway. Gary is interested by this piece of information. When he's gone, Madge seems a bit suspicious. Anne tells Bill he's lucky she likes world-weary, cynical older men! (he's still suspicious about Gary). Bill says he'll have to get a job. Anne's sad that she won't see him as much. Bill says he'll be able to take her away for a holiday when he's got some money. Paul runs in wearing the T-shirt and begs Harold not to let anyone in. Four girls who obviously have a better grasp of misspelt French than Paul(!) manage to get in and start kissing him! Paul tries to get away but fails. Harold sends them off, trying not to laugh. Susan is sitting at the table looking bored. When she hears someone (Bill and Anne) coming she runs back to the settee and picks up a magazine. Bill asks her if she's really been doing nothing all day – no housework or anything. Susan says she hasn't, so Bill has to cook dinner as per their bet. But Bill says she was heard being “sensational” on the radio talking about the school. Bill reckons it counts as work!! Susan tries to wriggle out but has to admit Bill is right and she has lost the bet. 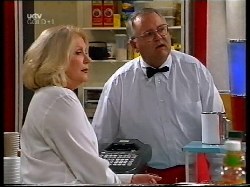 She says she's not cooking though, she'll give Bill the money to get some takeaway! The phone rings – it's Phil to tell Anne that Gary has turned up again and wants a word with her. Harold is still giggling about the T-shirt incident. Madge comes in with bottles of wine. Paul gets very angry and storms off to his room, much to Madge and Harold's surprise. Gary asks Anne if he can have a look at Lily's papers in the hope of finding some keepsake. 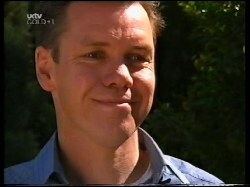 Gary tells Phil he's heard Lily was very vague towards the end but Phil disagrees – he always found her very bright. Anne comes back with the papers. He asks Anne if he can take them back to his hotel and he agrees. When he's gone Phil says she shouldn't have let him take the papers away – he's still suspicious. Madge realises what Pauls' upset about – he doesn't want alcohol round the house while his Dad is there (because Paul's dad is an alcoholic). Joel looks at the front cover of the paper. He throws the paper across the room in anger.